The Pearl Izumi SELECT Thermal Lite Arm Warmers are seamless and lightweight, perfect for cool days, and when the weather warms up, they stuff compactly into a jersey pocket. Pearl Izumi's SELECT Thermal Lite fabric offers lightweight insulation perfect for mild conditions, and the knit construction stretches to fit without constricting or slipping. What to say, they fit and they keep my arms warm, end of story. Oh, the bright green is great for visibility, too! Love these arm warmers. They grip well, even with my skinny arms. Those arms stay warm, too, down to 35deg. Works very well. High Vis is effective. A bit short. My new favorite at a great price! My new favorite arm warmers, and at a great price! 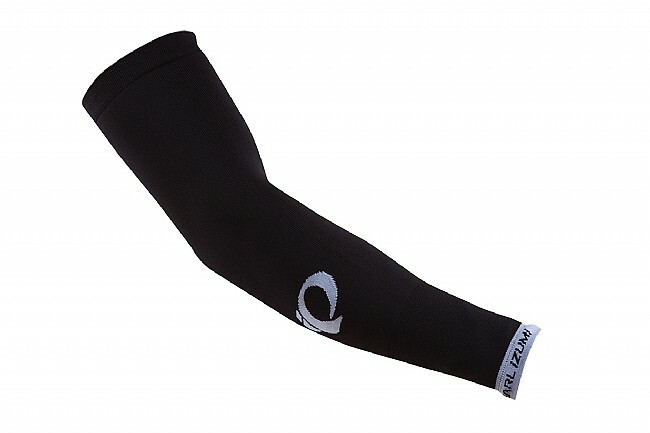 Being a big fan of arm warmers, I am always searching for the perfect pair. These are nice and long, stay up, and are not too heavy but warm enough. Pleasant surprise to find such a quality product at such a great price! I love the thickness and fit of these arm-warmers. And the hi-vis color of them is fantastic. They fit and work well, staying snug and keeping my arms warm. Great value too! I bought these because they were on sale at a great price. They are not quite as nice as my other Pearl Izumi arm warmers. My other PI warmers have a fitted tapered sleeve end, a warmer fabric and are a bit longer. On the plus side having a lighter material allows me to choose which warmer to wear based on how cold it is outside. These also stay up very well and the white sleeve end is very stylish. At this price it is a very good purchase. The size Large are a perfect fit for me at 6'2 170. They look sharp and serve the intended purpose without any issues of sagging upper arms or discomfort from tags, stitches, or tightness. I love these arm warmers. Stitching is holding up and the fit is just right even on the upper arm where some arm warmers sag and slide down. I like the looks of them, too, with the logo and white accent on the wrist cuff. Perfect for nearly everyday in the Northwest. Next to tubes, this is my go-to piece of gear, which is why I bought a second pair. From early summer mornings to cool fall days and into full-blown winter, I use the Pearl Izumi Select Thermal Lites on their own or under a rain shell. I love them because I don't overheat, yet they also keep me cozy when chilled. I've had many incarnations of the PI arm warmer and these were done right. No loose threads after washing, no stink, and the bright yellow is super visible when riding in traffic. Arm warmers and a vest can make early morning rides much more comfortable and these certainly work in that regard. I have cyclist arms but these fit well. They were on deal of the day and it was, in fact, a great deal!!! I have had several different Pearl Izumi arm warmers but these aren't as good as the previous ones I had. The material is more like a pair of old athletic socks on your arms instead of the form fitting ones from before. They are Ok but not a favorite. The price on sale was good but after using them a couple times they haven't left the drawer. These replaced some 10 year old arm warmers and are great for a chilly morning. They fit great and don't slide down or need to be adjusted over the course of a ride.